Hanuman is a 2005 animated feature film released by Sahara India Pariwar of India, Percept Pictures and Silvertoons. The film dramatizes the life of its title character, Hanuman, a Hindu God. The animation was created by Silvertoons. It is India's first major commercial family animated feature (there were several earlier ones made by Pentamedia Graphics). A companion film, Hanuman Returns (later retitled Return of Hanuman), was released on December 28, 2007. The story is different from that of its predecessor; due to this, a disclaimer is stated at the beginning of the movie. The screenplay of this animated movie depict the part of Hanuman's life from his birth. The narration is by actor Mukesh Khanna. The movie relates how Hanuman was born to Anjani (a female Apsara) and Kesari, by the blessings of Vayu-Dev, the Wind God. 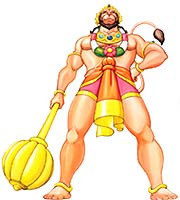 Hanuman, who is the 11th rudra avatar of supreme being GOD Shiva himself. He was blessed with supreme intelligence, strength and divine powers. 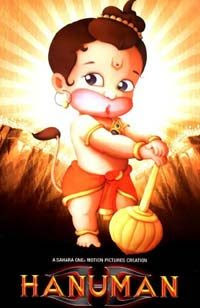 As a baby, Hanuman was quite naughty and used his powers to pester the saints living in the nearby forest. Once when he was hungry he leapt to catch the sun thinking it was a fruit. 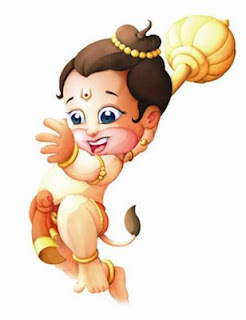 On the insistence of Vayu, Indra and the other Gods came together to bless baby Hanuman of immortal life. Amongst the other blessing a few are: no fear/harm from the Brahmastra, no harm could befall him from any weapons, fire and water. He could overcome death and he could transform his body to take the smallest form or attain the biggest form of life. Blessed with divine powers Hanuman grew up to be powerful and mighty. He helped Lord Ram and Laxman in their search for Sita. Hanuman burned the golden city Lanka and he with his super powers helped Lord Ram and Laxman defeat Ravana and secure the release of Sita. Seeing his devotion and love towards him, Lord Ram blessed Hanuman with the boon of immortality.